A US Air National Guard c-130 cargo plane crashed near Savannah, Georgia today, killing at least five on board, authorities said. The plane was on a training mission when the accident occurred at roughly 11:30AM local time. The Associated Press reported that between five and nine passengers were on board, reportedly National Guard members from Puerto Rico en route to the US mainland. A photograph tweeted by firefighters at the scene showed the tail end of the plane ablaze alongside Highway 21 near the Savannah/Hilton Head International Airport. Debris was shown scattered across the road, a pillar of black smoke rising from the flames. 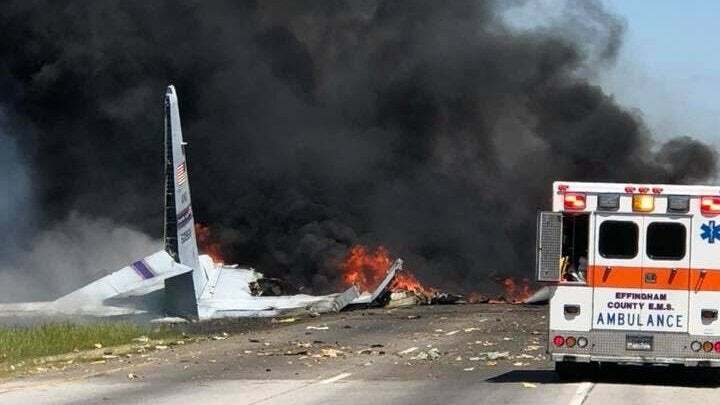 A spokesperson for the Savannah Professional Firefighters Association told Military.com that the tail section was the only part of the plane that remained intact. The names of the victims are behind withheld until family members can be notified, authorities said. According to CBS News, the Savannah Air National Guard Base has been heavily involved in the recovery efforts in Puerto Rico following Hurricane Maria.